A round up review of my best and worst baby buys. Top of the list definitely has to be the BEDNEST. I hired this from the NCT. The moses basket or crib is one of the more bulky baby items but is used for such a short time so when I saw an advert for the hire of this bedside crib I thought it was perfect. £79 for 6 months or as long as you need it or until they grow out of it whichever comes first. Both sides of this crib drop down and the height is adjustable so it can sit alongside any parent bed. The sides are mesh which aides airflow and you can adjust it so it is tilted. Absolute Godsend for us with babba’s silent reflux. The Bednest is delivered to your home on a day you specify and sent with brand new sides (that are material), brand new mattress and 2 new cotton fitted sheets. I can’t exaggerate enough how easy it is to assemble it basically pops up which also makes it great for travelling. Then when you want to send it back you just keep the box it came in and email them and they arrange a courier collection. I have just extended my rental period – for free! You can buy them also if you would wish to. Far and away the best bit of baby gear ever. The MOBY WRAP. Bought this one in advance this time around as it was so useful with my first baby. It’s basically a long stretch of fabric that you tie around you in a certain way to carry the baby on you and once you have you tubed it and tied it once it’s really easy. I’m a BIG fan of the Moby wrap. It keeps newborn babba close which is lush in those early days and it makes you hand free so you can make a cuppa. Another absolute Godsend for silent reflux as my baby needed to be kept upright so he basically lived in my Moby wrap for the first 3 months. There’s loads of colours, I grabbed mine on Amazon for about £40. Don’t be lured by the cheap imitations, I’ve tried a couple of them and they had too much give in them. ‘Sterling Baby’ SWADDLE blanket. I picked this up in TK Maxx on a random pregnancy induced shopping spree. Well I have used it every night. Baby kept waking himself up flinging his arms out with that newborn baby reflex that makes them look like they think they’re falling. Wrapped him in this and hey presto….sleep. It’s lovely and soft and has Velcro tabs. I’m sure you can buy these in a lot of places. Super cute too. The MAXI COSI PEBBLE car seat deserves a mention in the top 5. Easy to use with their family fix base which you can also use for the next stage up car seat, the Pearl. It has a reclined position that I just haven’t found in other brands of car seat. Also top company who fixed our 6 year old family fix isofix base free of charge so we could continue to use it with baby number 2. Big thumbs up Maxi Cosi. Lastly the FISHER PRICE BOUNCER CHAIR. Really vibrant bright colours, lovely positioned seat for baby, foldable so great for travelling (or moving house) and rocks easily with no dreadful squeaking. My baby is 5 months old and I think he will have a few more months usage out of this still. Great buy. 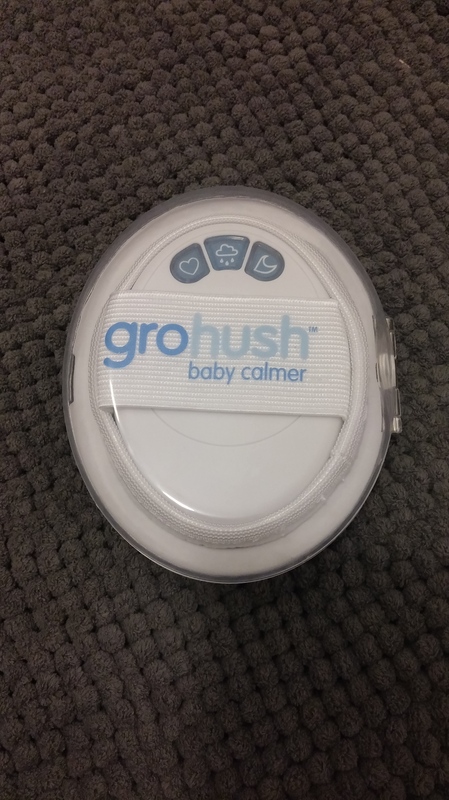 The GRO-HUSH baby calmer. Can Gro really let me down? One of my most trusted brands when it comes to baby stuff I thought it seemed a bit far fetched but bought it to try anyway (there’s a reason there’s money in products that claim to help a baby stop crying)! I really like this little gadget, even if it is on the not-so-good list. It’s a hand held device with a soft cushion on one side that plays 3 different types of white noise; heart sounds, rain and waves. It is designed to be held against baby’s ear i.e. sound levels have been checked. It comes in a very useful little case so you can pop it in your bag. The instructions do say to continue regularly using at first to allow baby to get used to it but it didn’t really work for us. To be fair, my baby had pain so wasn’t just your run-of-the-mill unsettled, he actually needed medication so I would still suggest this product but wouldn’t necessarily recommend. Mothercare’s own brand spotty BABY BOUNCER chair. Husband bought this one due to the more upright position compared with other baby bouncer chairs but it was too small and so we only got about 3 months use out of it. The left picture is Mothercare’s own brand spotty chair compared with the Fisher Price chair on the right picture. It was only a tenner so good for the price but probably better off buying a bigger one to begin with. Large SWADDLE MUSLINS. These were a part of my TK Maxx shopping spree. I got them thinking they would be good to swaddle baby in the hotter summer months, being rather clever thinking ahead to his size, however, he just pulls them apart. They are very useful though after a bath for drying baby. MEDELA SWING ELECTRIC BREAST PUMP. Ooh controversial! I was a massive Medela fan until I tried the Ardo. It’s just more comfortable, quieter and I would totally recommend it. DOUBLE PUMPING BRA I made my own one of these by cutting holes in an old sports bra and it worked a treat! Double pumping every 3hrs round the clock went from being a hassle to time for a cuppa and texting marathon. I measured up by eye whereabouts the funnels would go, marked with a sharpie and cut. No hemming and it held in place brilliantly. A new PRAM. Don’t get sucked into it! The amount of times I’ve seen a mum at soft play wince every time a sticky toddler runs past the limited edition print of the new pram. It’s just not worth it. I chose to buy 2nd hand from a friend and it’s fab. Babba has hardly used it as he is generally carried anyway. ELECTRIC STERILISER another pretty non essential item in the early days if you are breastfeeding due to the lack of use it will probably get. I have a cold water steriliser which works well and sterilises in 15mins with the milton solution. I’ve never personally used an electric one and would think it’s probably more to do with personal preference. There’s always the old boil in a pan of water technique to make one less baby item to buy. Mummy Needs Some Me Time. Like you, I didn’t find pumping bras to be necessary. I found that regular nursing bras did the trick just fine. Thank goodness, since I had to return to work when my twins were 11 weeks old. (Maternity leave in the US is awful.) Here from #bestandworst. Ooh I was just today wondering if they were a worthy buy or not-thanks! I loved reading these lists while I was pregnant. I don’t have a Moby, but I do LOVE my baby wrap. Best. Invention. Ever.